Listen to TCCC updates on the TCCC and Combat Casualty Care Podcast. Available in most podcast stores and applications including iTunes. You can also listen to the podcasts on the Podcast channel of the Deployed Medicine app and website. You can access all of the most up-to-date TCCC education materials at www.deployedmedicine.com/tccc. Deployed Medicine is joint DoD-sponsored partnership of the Defense Health Agency and the Joint Trauma System to trial new and innovative learning models aimed at improving readiness and performance of deployed military medical personnel. The intent is to deliver personalized, dynamic learning using the most current and accessible technology, enabling a self-directed and continuous study of medical best practices and lessons learned. 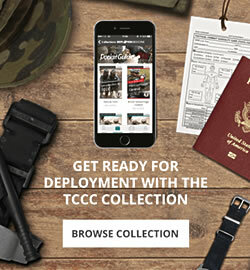 Official and up-to-date TCCC material is available through the mobile application "Deployed Medicine". You can download DM using your mobile device's app store and is available for iOS, Android, and Google platforms.